And yet, in their immediate career retrospective of David Bowie, the BBC didn’t even list mention it. Perhaps the oversight can be explained because the movie bombed in cinemas. 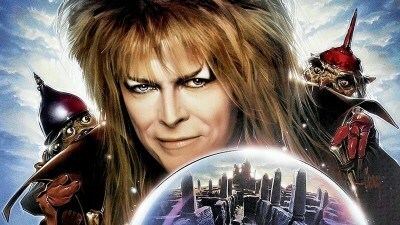 Perhaps the oversight can be explained by the fact that Labyrinth is a genre film, which high-falutin’ types tend to ignore under the best of circumstances, or because it’s nominally a children’s film, which to many people signifies ‘forgettable’ ‘disposable’ and ‘unimportant.’ Or perhaps people just think Labyrinth is too weird to take seriously. All in all, Labyrinth is an often-overlooked film of surprising depth and tenderness, and one which deserves to be considered a children’s classic. Not least because it introduced an entire generation to David Bowie. A brief run-down, in case you don’t know the film or haven’t seen it in a while: Sarah (a young Jennifer Connolly) is left baby-sitting her baby brother when her father and his new wife go out for dinner. Sarah, a fan of fairy tales, long dresses, and all things fantastical, resents being made to babysit and wishes that the goblins would come steal her brother away. 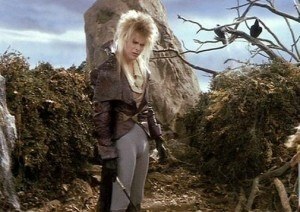 Unfortunately for Sarah, the Goblin King, David Bowie’s Jareth, is listening… and does her bidding. 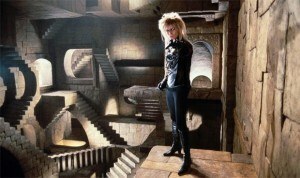 Sarah panics and asks how she can get her brother back; Jareth gives her 13 hours to make her way through a spectacular maze, at the centre of which lies his castle. While he throws obstacles in her way, Sarah travels through the maze and learns what it means to be a responsible adult. Also there’s a fart-bog. And muppets. Lots of muppets. It’s easy, when watching Labyrinth, to get caught up in the film’s superficial trappings – the score, the ’80s soundtrack, the muppets. But it’s also a layered and very nuanced examination of what it means to grow up – the choices we have to make, and the difficulties we face when leaving behind the comforts of childhood. Do you still have some of your childhood toys? Do you remember a time when they were your constant imaginary companions? Sure you do. Do you remember how tough it was having to give them up? Yes, you do. 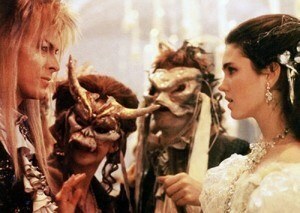 Labyrinth is about the trappings of childhood. And, in the world of the film, they are literally traps, personified by the character of the old woman who hands Sarah all her toys in an effort to distract her from her quest to save her brother. But, Labyrinth posits, the things we loved in childhood are also a bedrock upon which the foundations of a good adulthood (and life) are laid: every friend Sarah makes in the labyrinth is constructed from the affection she has for her toys, and her own imaginary life. Next time you watch Labyrinth, keep an eye on the props in her bedroom; they’re all reproduced somewhere in the labyrinth. The friends she makes are living versions of her soft toys; the castle is based on an MC Escher print on her walls; even her ballgown and Jareth’s costume during the masked dance (set inside a bubble) is based on a dancing couple under a bell jar probably a music box on her dresser. Labyrinth is also about all the terrors of adulthood, and all awful, stupid adult stuff that teenagers hate and fear and, above all, don’t understand about what lies before them. Adulthood is a maze, full of pitfalls and dead ends; there’s no map, and what help you get along the way is determined by your own relationship with the people you meet. In Labyrinth, that maze is literal; it’s right there in the title. Sarah has 13 hours to get from the edge of a vast labyrinth to the castle at the centre; every time she seems to be gaining on her goal, something sets her back – sometimes it’s just bad advice, sometimes its her own bad decisions, and occasionally it’s just random unfairness, as when Jareth speeds up the clock, giving her even less time to complete her quest. The castle at the centre of the maze is a confusing dreamscape of fantastic angles and gravity-defying architecture, making it nearly impossible for Sarah to actually get her hands on her brother; every time she takes her eyes off him, he’s somewhere else, behind, above, below or beneath her… her path forward is never straighforward, and rarely makes sense. Ultimately, however, Sarah’s realisation – and the moral of the film – is that we are defined by our childhoods, and that, for all we grow and change, we never truly leave childhood behind. 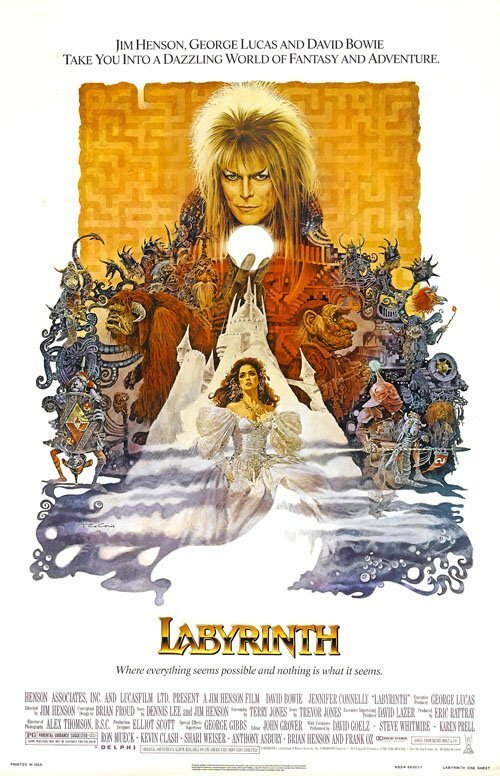 Labyrinth is a sweet and, in the end, level-headed look at childhood, and the transition to adulthood that begins when we’re teenagers, that may have been a bit ahead of its time but is much easier to appreciate in a post Pixar/Inside Out world.Labyrinth deserves to be recongnised and cherished as a classic children’s film. Bowie’s Jareth exists to tempt Sarah away from the responsibilities of adulthood, but he does so both by removing those responsibilities (he steals the baby brother she’s meant to be looking after; he sends her distraction after distraction, designed to keep her from completing her quest)… and by tempting her with the trappings of a fairy tale life she thinks she wants. A fairy tale life that includes a huge ballgown and a very good looking man pledging eternal love to her. The fairy tale aspects of Labyrinth are hugely important to the film’s themes; fairy tales are wonderful, the film suggests, and teach important lessons (including giving Sarah the knowledge that she needs to defeat Jareth, during a scene in which she quotes lines from her favourite story). But they’re also dangerous; they suggest a version of adulthood that isn’t real. In this context the symbolic significance of the masked ball scene cannot be understated; Sarah is finally wearing a princess’ gown; she’s surrounded by beautiful people and dancing with an undeniably attractive man. But what was a dream for Sarah at the beginning of the film is a confusing, sinister reality: the masks are grotesque, the dance itself is overwhelming, and the illusion is flimsy and delicate, one that comes crashing down the moment it is interrogated. Most importantly, it’s all just another distraction – a lovely one that preys on what Sarah thinks she wants from her life to come, rather than one that relies on her desire to cling to what has come before – but a trap none the less. The sexuality of Bowie’s performance is key to what makes Labyrinth’s story special; it’s not unusual for a children’s film to tell a story about a kid learning what it means to be an adult, but it is unusual to layer that story with sexual longing. Bowie’s performance is undeniably sexual without being either predatory or scary. He represents what Sarah thinks she wants in a love interest; he’s handsome, powerful, and can give her what she believes she desires, more than anything else: freedom from responsibility (as represented by her baby brother). His pledge to her, ‘love me, do as I say, and I will be your slave’, is a potent and powerful one, and it’s entirely down to Sarah’s growth during the movie that she’s finally able to understand that what he’s offering isn’t power and freedom, but isolation and selfishness. Labyrinth wouldn’t work if Sarah were older than she is in the film; she wouldn’t be clinging to her childhood with the same ferocity. And it wouldn’t work if she were younger, either; a child wouldn’t feel the same conflict between freedom and responsibility. Nor indeed would a younger child find Bowie’s Jareth a temptation in and of himself, as Sarah does. In order to be effective, Labyrinth requires a woman on the cusp of adulthood, a young teenager torn between toys and games and the happy irresponsibility of childhood and the responsibilities and desires of adulthood. Let me tell you ’bout the babe? (What babe?) The babe with the power. (What power?) The power of voodoo. (Who do?) You do! Let’s not beat about the bush; the music is… very 80s. It’s also fun, catchy, dance-able and did we say fun? Really fun. Bowie’s performance is undeniably charismatic. The eyes. The cheekbones. The singing. The dancing. Opinions may be mixed about his mullet, but his trousers are very tight. Very tight indeed. In the final, brilliant confrontation between Sarah and Jareth, Sarah realizes the truth of Eleanor Roosevelt’s famous line, ‘no one can make you feel inferior without your consent.’ That is, people only have what power over you that you yourself give them; when Sarah finally realizes that Jareth’s only real power is her desire for him and her fear of him, and that she’s ultimately in control of her feelings, it brings the illusion he’s created crashing down around them. Say it with me now: you have no power over me. As far as life-lessons go, it’s a good one. What better way to celebrate our generation’s relationship with David Bowie than by paying homage to its beginning? Friday Favourites: Time Travel Tales Let's go time travelling. The science fiction and fantasy films to watch in 2016 Where to get your fill of science fiction, fantasy and horror on the big screen in 2016. You know, I’m nearly 27 and I’ve never seen Labyrinth. This article makes it seem like it’d be worth checking out for more than just the nostalgia factor. Haven’t seen it in a long time, but what a terrific film, brimming with great ideas. Off the top of my head, I recall being haunted by the “straight path” that isn’t. And the hand creatures! I’ve had the entire soundtrack cycling through my head since I heard of Bowie’s death. I will certainly miss him.